We all like to go off the grid every now and then. At Spring, we believe you should be able to take your music wherever you work out. That’s why we developed the Network Assist feature. By preloading your music selections before your workout, Network Assist allows you to take Spring with you, anywhere you go. Going for a run in the woods? Rowing on the lake? Cell towers don’t always reach these locations — but that doesn’t mean Spring can’t. Maybe you’re running low on this month’s data. Hook up to WiFi and download your music before you head to the gym! Network Assist is here to prevent connectivity issues during your workout to ensure a smooth music listening experience. Here’s how. When in good data range or on WiFi, prepare for your workout as you always do by selecting START on the homepage. 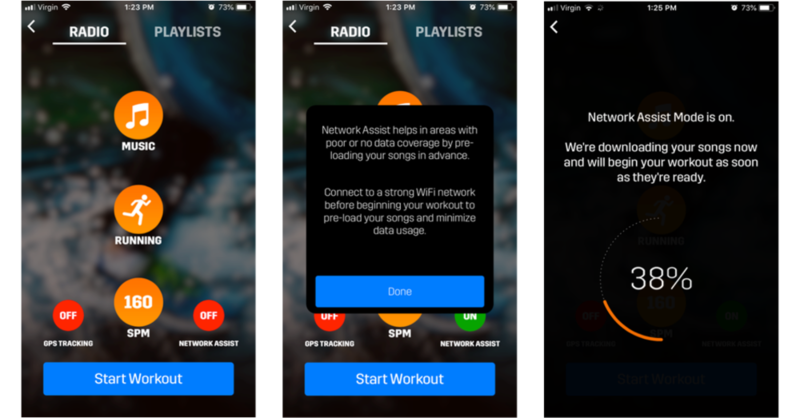 Once you’ve set your music and workout preferences, simply tap Network Assist on the bottom right corner of the page. Here, you’ll get a notification about Network Assist and how it works. Click done, and you’ll notice the Network Assist icon has turned green. Next, hit “Start Workout.” Your music will immediately start downloading. Once your selections are downloaded, your workout will begin automatically. If you’re saving it for later, simply hit pause! Head out to your favorite running spot. Your songs are loaded and ready to go.